As an air sign, Libra is all about intellect, so Uranus in Libra always has something on their mind. They constantly come up with new ideas and look at things in different ways. Because they listen to all sides of an argument, they are well-equipped to find the right solution. Uranus in astrology represents new unconventional technology, revolution, changes, enlightenment, and creativity. With their eye for beauty, Uranus in Libra is often inspired by the world around them. It doesn’t take much for them to see the bigger picture, and they use that skill to enhance their level of intuition. Combine that with their vivid imagination and you have someone who is always spouting out inventive ideas and theories. And when they are really interested in something their enthusiasm is infectious. It simply takes the Libra Uranus sign awhile to get the ball rolling because they tend to be indecisive. Although they can be slow to act, Uranus in Libra zodiac sign has plenty of progressive ideas to bring to the table. As long as they have the freedom to do their own thing they are very helpful in solving problems or figuring out the next best step. And with their wit and charm, they draw others into their world of justice and diplomacy where everyone is equal. And although they may come off as eccentric sometimes, this simply means that others can be as offbeat as they want around them. 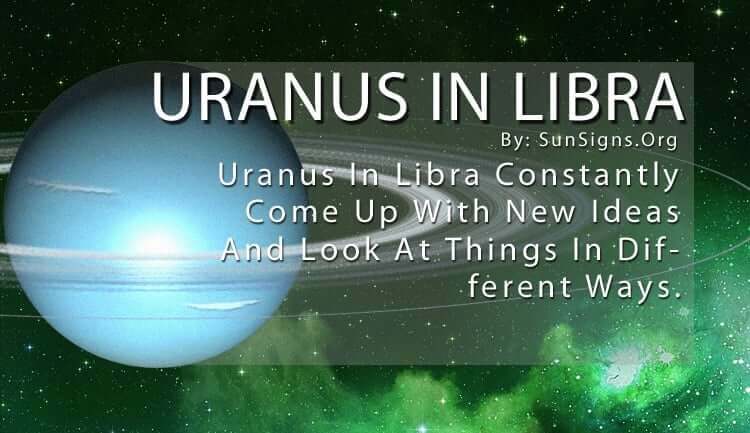 Another way to encourage Uranus in Libra is to give them some space. They don’t like feeling forced or crowded, whether physically or metaphorically. So be sure to give them plenty of breathing room. This helps to keep them calm, as they can have a short temper. But because they are so obsessed with balance in their lives, their anger doesn’t last long. It’s also the need for harmony that drives most of their decisions for the Uranus in Libra people. If they discover something that will make the world a better place then they will make it their number one priority to make it happen. This also comes in handy when they are working as a team. They are a team player as long as others stay out of their way. They don’t have to lead the group, but when given a task they like to be left alone to finish it in their own way. But they also allow others to work however they feel is best, which makes Uranus in Libra easy to be around. They have an open mind and are very accepting of other people’s views and beliefs. Being a social butterfly they often have a large circle of friends and loved ones.